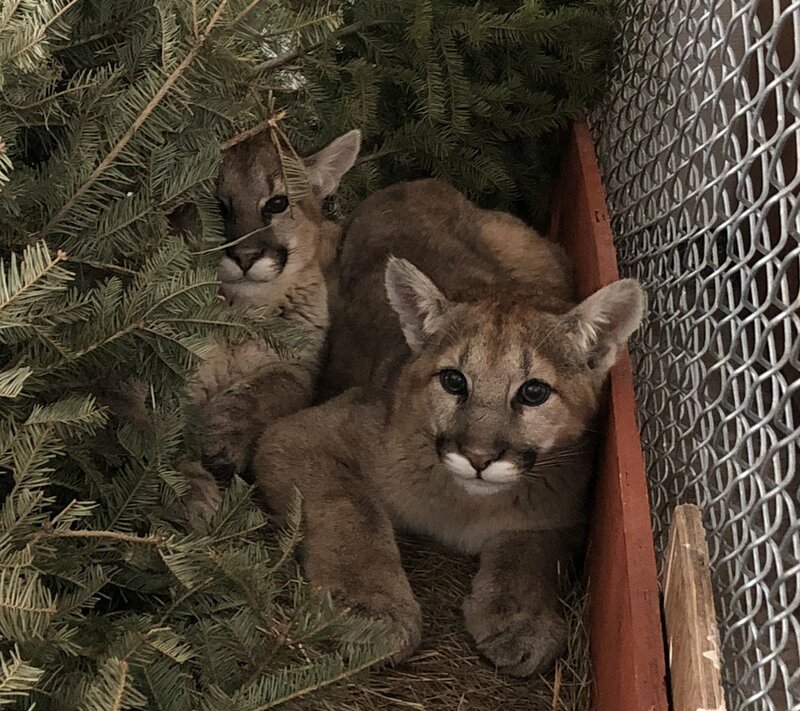 We need your help saving some beautiful mountain lion cubs! About a month ago, a mountain lion was hit by a car and killed in Wyoming. Her three cubs were about five months old, and would have spent another year and a half with her learning how to hunt and live on their own. The cubs came in close to town, and the male succeeded in killing a deer on someone’s lawn. At that point, Wyoming Game & Fish had to step in. Rather than euthanizing the cubs — standard procedure across the country in most cases like this — they chose to look for a way to keep the babies alive. They called us. We don’t have room for three more mountain lions here at Yellowstone Wildlife Sanctuary. They may be cubs now, but they’ll be full-grown soon enough and they’ll need a lot of space. We found a facility that does have room — a fantastic sanctuary called Shambala in California — and they agreed to take all three if we couldn’t get them released into the wild. At that point, we enlarged and outfitted our quarantine area and told Wyoming Game & Fish we could take the cats. Starting the rebuild of the 300 square foot quarantine area, which is inside a heated barn. Since they were expected to spend a couple of weeks with us, a box with a concrete floor wouldn’t cut it. We had to attach a water bowl to the fence, set up a way to get them food, put in “habitat furniture” like igloo dens, hay bales, trees, and bedding, and work out a transfer mechanism to get them in and out safely. As this was going on, we scoured the country for a rehab and release operation that could put the cubs back into the wild. Unfortunately, we’ve been unable to find anyone that could do it. After the trees, dens, and bedding have been brought in. There was obviously paperwork to do as well. Various government organizations had to be notified, we had to get clearance from the state of Montana, and the cubs had to be vet-checked and chipped before crossing state lines. Once that was done, we brought them in. They arrived rather unhappy (here, the male cub is letting us know what he thinks of being moved), but healthy. Wyoming Game & Fish had been feeding them well, and they’d already put on some weight. When we transferred them to our quarantine area, the sisters went immediately for the sheltered area that we built for them. Throughout this process, costs have been building up, and that’s just the beginning. We’re looking at extra staff time, vet bills, transfer crates, rental of a van to take them to their permanent home in California, and more. If we want to be prepared for this kind of rescue in the future, we need to substantially improve our holding pens and construct at least one more permanent outdoor cat habitat. How can you help us? We’re glad you asked! Any cash donation will be gratefully accepted, and you can do that right here on our website. We also need a van for safer and warmer transport than our pickup trucks can provide. If you can help, we — and these beautiful cats — will thank you for it! We are a registered 501(c)(3) nonprofit and all donations are tax-deductible. Donate to the Cat Rescue now! Gary Robson, who has been running the education department for the Yellowstone Wildlife Sanctuary since last March, has been promoted to Executive Director of the Sanctuary effective today. Prior to that, he served on the Sanctuary’s Board of Directors. For about four years, the Sanctuary has operated without an Executive Director, with four department heads reporting to the Board of Directors. With the number of projects and improvements in the works, the Board felt that it was time to put a single person in charge of the Sanctuary. The Board made several other changes in staffing, including promotions for Nigel Murphy and Koby Kasten, elimination of two positions, and the creation of three new positions. Those new openings will be posted on the Sanctuary’s website and elsewhere. Two of the Sanctuary’s big projects, the new gray wolf habitat and the migratory bird building for the sandhill cranes and turkey vultures, are nearing completion. This summer, the Sanctuary added a new raccoon, a ferruginous hawk, and two coyote pups. The front deck was rebuilt, and the Sanctuary is now raising funds for a remodeling project in the education building. The Yellowstone Wildlife Sanctuary is extremely grateful for the generous donors who supported us through the Fun Run. We appreciate each and every one of you! Providing life long sanctuary to wildlife is costly, but we are dedicated to our mission and believe that although it is unfortunate our wildlife are not able to live in the wild, their lives at the Sanctuary are safe and fulfilled because of the support we receive through donations. Some of our habitats are over 20 years old and no longer meet the needs of our wildlife. Each year we try to update one of these outdated habitats. During 2017 and 2018, we used money from the Fun Run and other grants and donations to expand our wolf habitat so we are able to offer sanctuary to 3-4 wolves in need of sanctuary when it is completed. We also embarked on our largest project and built a new sandhill crane and vulture habitat. We are finishing this project up and it will allow our cranes and vultures a safe and warm enclosure with natural lighting during our harsh winter months. This also allows our education programs related to these species to continue throughout the year without interruption due to bad weather. 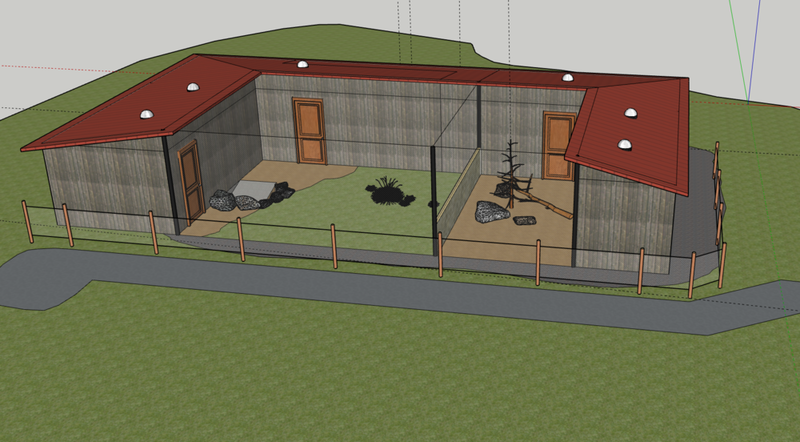 In looking to the future, we are planning on construction of a new felid habitat which will allow our mountain lion, Sacajawea, to have more area on flatter ground and thus she will be able to be more active without having to move up and down an incline which is painful due to arthritis in her front legs. 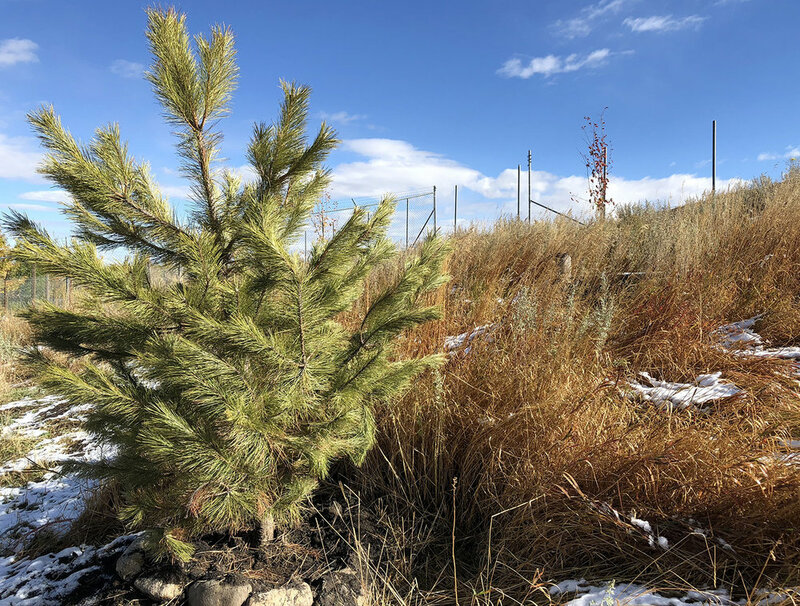 This project also opens up other exciting opportunities for the Yellowstone Wildlife Sanctuary that we will be able to share with the public as construction and updates to the wildcat habitats near completion. As always, we look forward to your visit to see our wildlife and the ongoing progress happening because of your generosity. Part of the Fun Run experience is volunteering. Many of the Sanctuary staff and board members were helping out at the Fun Run, including Sue & Lynn, who were race coordinators. Gary (holding the skull above) staffed the Sanctuary’s education booth. Once the snow and rain stopped and the ground dried, we were able to get started on the expanded wolf habitat. As with most construction projects, there were set backs that delayed progress. However, we are happy to report we are nearing completion of this habitat. When you visit us, you will see there is still work to be done, but we are very close to having the habitat finished. See Our Wolf Habitat Page - and donate! 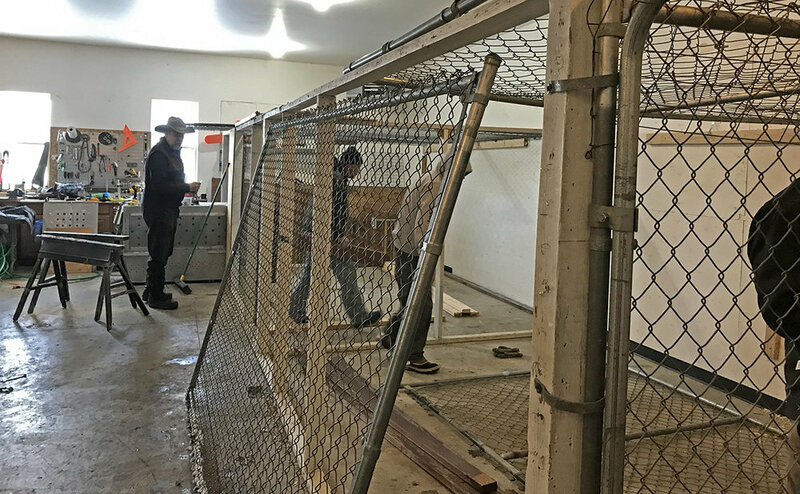 When you visit the Yellowstone Wildlife Sanctuary, you’ll see the fencing is installed and the ground where the lockout gates will be located has been leveled. The posts are set for the gates and the guillotine-style transfer gate is being built. This leaves the top wire to be threaded through the top posts to prevent any climbing out. Once these final 3 steps are done (gates installed, guillotine placed, and top wire threaded), we will clean up the construction debris and place the enrichment features. Colder weather is knocking at the door and we are working feverishly to get these final steps done. We are as excited as our supporters and visitors to have the habitat ready for wolves. So when do we actually get our new wolves? That depends. It can take a while to find a pack that requires sanctuary, and to do all of the required transfer paperwork, both Federal and state. It may happen in a month, and it may happen next spring. But once the habitat is complete, the process can begin! Fencing costs are higher than home chain-link because we have to use heavier (9-gauge) fencing to meet AZA standards, as well as making it 8 feet high and adding top wires. Do those new fenceposts look rusty? That’s because a part of our conservation program centers around recycling and re-use. These posts are actually repurposed pipe stem from an oil rig. 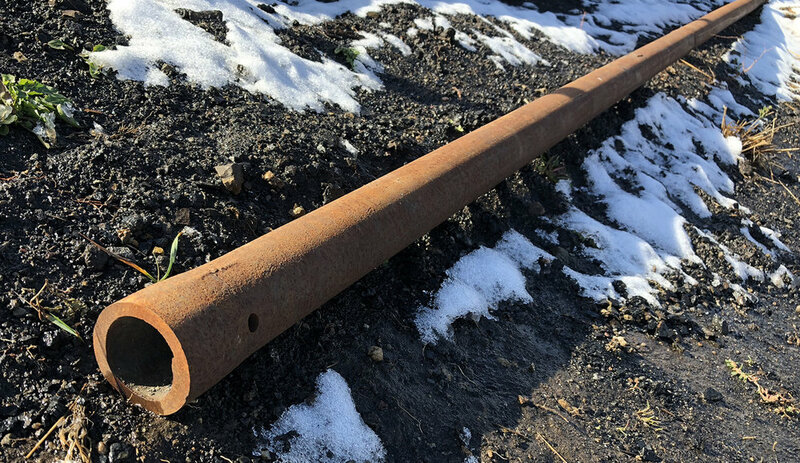 They are stronger than regular fenceposts, we get them cut to any length, and they don’t end up in a scrap yard somewhere. Everybody wins! Wolves are excellent diggers, so our staff is laying fencing underground and tying it to the perimeter fence to stop them from digging out. Habitat design doesn’t stop with periphery fences. Landscaping improvements include terracing, addition of about a dozen new trees and bushes, and planting a variety of native grasses. It's been complicated. A while back, the person responsible for some of the Yellowstone Wildlife Sanctuary's social media accounts moved away. We have multiple administrators on our Facebook and Instagram accounts, so that was no problem. We temporarily lost control of our LinkedIn company page, but their tech support group was helpful and we recovered it without much issue. Twitter was another story entirely. There was only one person responsible for our Twitter account — a mistake we won't make again. For quite a while, the account was just ignored, as it had been linked to our Facebook account and everything we posted on Facebook magically appeared on Twitter. As we got more of a handle on our social media presence, one of our staff spent weeks trying to get control of the Twitter account. She emailed, she called, she offered proof that it was ours, and Twitter was of no help whatsoever. They wouldn't even delete the account for us. So we are doing this the hard way. Today, the last post went out to the old Twitter account (through Facebook), and a bright shiny new one went online. We've disconnected Facebook from the old one and we're spreading the word that all of our Twitter followers need to follow @YWSanctuary instead. We'll see you all on Twitter! TL;DR VERSION: Follow @YWSanctuary on Twitter instead of the old @YellowstoneWS account. The Yellowstone Wildlife Sanctuary hosted its annual Wildlife Jamboree fundraiser on Saturday. It was a day of fun and games, but also an important fundraiser and educational opportunity for the Sanctuary. Sponsors and donations were a big part of the success of the event, and that’s important to an organization like the Sanctuary which is funded by grants, donations, admissions, and memberships. There were sponsored animal feedings throughout the day, paid for by Bank of Red Lodge and Samantha Thomas. Visitors were able to watch bear, mountain lion, bobcat, lynx, raccoon, and porcupine feedings and learn about the animals, what they eat, and how the Sanctuary cares for them. The Forest Service participated in the Jamboree with bear spray trainings, a bear education table, and visits from Smokey the Bear. There was also face painting, rock painting, barbecued burgers & hot dogs, and temporary tattoos. All of the food and drinks were donated.